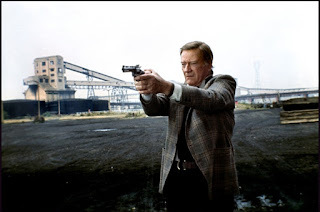 A police action film, Brannigan borrows heavily from the trends of the day and offers plenty of over-familiar London scenery but nothing remotely original. Tough veteran Chicago cop Lieutenant James Brannigan (John Wayne) is dispatched to England to extradite his number one nemesis and criminal mastermind Ben Larkin (John Vernon) back to the US. In London Brannigan connects with Scotland Yard's Detective Sergeant Jennifer Thatcher (Judy Geeson) and stuffy but hands-on Commander Sir Charles Swann (Richard Attenborough). To their surprise, Larkin is kidnapped and held for ransom before Brannigan can get his hands on him. Larkin's slick lawyer Mel Fields (Mel Ferrer) connects with Swann as he arranges for the ransom money to be handed to the kidnappers. But what appears to be a straightforward swap turns complicated, especially with hired hit man Gorman (Daniel Pilon) out to eliminate Brannigan. Having turned down Dirty Harry, John Wayne scrambled to catch up with the burgeoning tough urban cop genre. After 1974's McQ, Brannigan arrives to scrounge not only from Harry, but also Coogan's Bluff (cop-out-of-his-cultural-waters). A British production directed by Douglas Hickox, Brannigan appears more interested in portraying itself as a 111 minute tourist commercial for London. Every other scene features a well-known landmark, with all the action contrived to take place near or around Big Ben, the houses of parliament, Piccadilly Circus and the Tower Bridge. As for the plot, the decent set-up of a criminal being subjected to a crime which may or may not be a ruse gives way to an extremely flabby mid-section, mainly designed to allow Wayne to tour the City in circles, and a bumbled ending that hurriedly wraps things up with barely an explanation. The Anglo-American cultural clash consists of Brannigan unintentionally insulting Thatcher with his bluntness, Swann and Brannigan exchanging a few barbs, and the Brits pretending to be bamboozled by a few American euphemisms. Wayne lumbers through the film unconvincingly, neither sharp nor agile. Attenborough as Swann alternates between haughty and clever in an uneven performance, while Geeson is given nothing to do except drive Wayne around town. Brannigan's low point is a prolonged and wholly unnecessary Western-style bar bawl in an English pub played for pure comic effect. He might want to pretend to be a Chicago cop, but try as he might, Wayne cannot get away from the wild west.